Somewhere down the stairs rest a few items more or less unconnected with CRPG creation, but for one reason or the other, you might find them interesting nonetheless. Also everything that just didn’t fit the other categories. 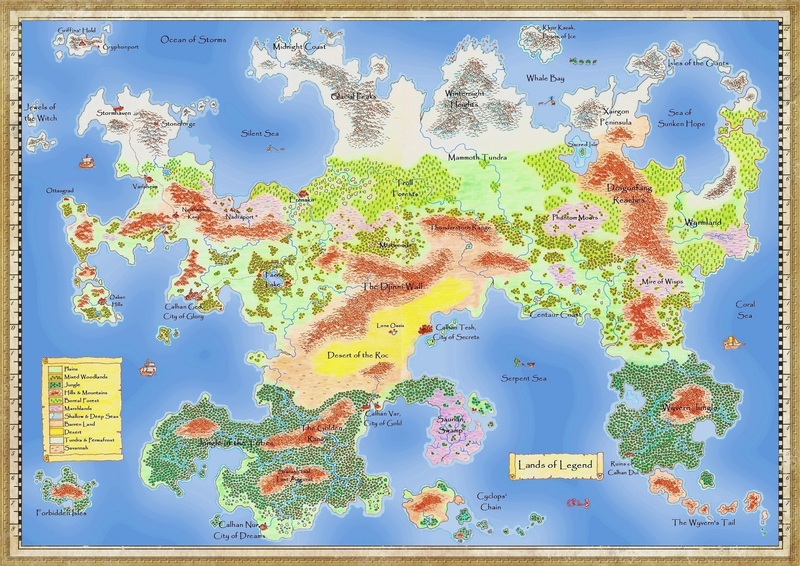 The Lands of Legend in their original, colorful form. It’s not keyed to any particular project, I just thought it would very well convey the feeling of an old-school RPG. If you think you have an even better use for it, drop me a line. If you’ve been around long enough to remember the golden days of Ultima and Might & Magic, you’re also bound to have played Warcraft II. I found those maps recently on an old disc. Of all the ones I’ve created, these are the best, as they are not meant to test your micro-managing skills (like most RTS maps), but rather confront you with interesting strategical problems. I’ve only tested them with the BNE.